I'm already gaming-crazy, thanks to playing Ultima IV on the Apple II, then Bards Tale 2 on the Apple IIGS. Then, I walked into a Software Etc. one night, and they had an Amiga 500 on display. The Amiga 500 was and still is the most advanced gaming machine in history compared to its peers. It was a quantum leap. I didn't know that yet, though. It was the greatest thing I'd ever seen in my life. Plus, the sound effects! They were amazing. It looked just like a televised football game, and it sounded like one, too. The game, of course, was TV Sports: Football. 11-on-11 football. Full season football, with playoffs. Beautiful graphics. Wonderful animation. Incredible sound. Because of this game, I had to have an Amiga 500. I didn't "want" an Amiga. It was much, much more than that. And I went into debt to buy it, and it was so totally worth it. IBM games of that era had EGA (16 colors) or even CGA (4 colors) graphics. And the sound was beeps and boops. The Amiga 500? 4,096 colors. 4-channel sound. As Eli would say, the Amiga 500 was beast. Beast! By the time I was done, I'd played over 20 full seasons and 300+ games of TV Sports: Football. I eventually played a ton of other games on the Amiga 500, but that was the first and always my favorite. By itself, that doesn't sound so different from anyone who finds a game and plays it for 100+ hours today. The time, though, was quite different. The Internet didn't exist. There were bulletin boards, but I never went on them, because that required a modem, which was a space-age piece of equipment I couldn't really afford. Because there was no Internet, games didn't have online strategy guides. Or wikis. Or anything. And because of that, exploring a game was a great adventure. One of my best friends at the time lived in the same apartment complex, and he came over every night after I got home from work and we played TV Sports: Football for 3-4 hours. Every night, for months. The game had a playing field that scrolled, but we didn't know that at first. The first 100+ games I played, I never threw a pass that made the screen scroll, because I didn't know you could. You moved the passing cursor with the joystick to target where you wanted to throw the ball, and my target was always inside the confines of the screen. One night, though, on the last play of the half, my friend moved the passing target and just kept moving it until it was off the screen and out of sight. Then he passed, and to our amazement, the ball kept moving when it reached the top of the screen, the screen started scrolling, and his receiver caught the pass over 40 yards downfield. We talked about that for days. Something else we discovered: linebackers could sometimes "squeeze" between defensive lineman prior to the ball being snapped, and if they could, they could then rush the quarterback without being blocked. You just found the hole, moved the linebacker back a little, and timed the snap. In two-player mode, it added an entire new dimension to play, because it forced the person on offense to have check-down routes and all kinds of things that normally weren't needed. Plus, there was that second or two of dread after your buddy found the hole between the defensive lineman. It was one of my favorite things in the game, and we found it completely by accident. There was no one to tell us--we didn't even know anyone else who was playing the game. There was also a bug. 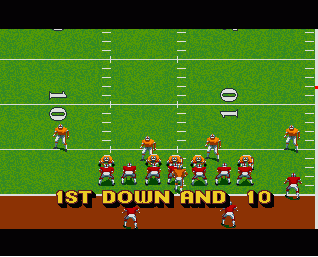 After touchdowns, a little cut scene with a dancing cheerleader would load from the 3.5" floppy disk. Every once in a while, this would white-screen the game, and there was nothing you could do but reboot. This happened a few times during "critical" games, and I finally decided to contact Cinemaware. If I remember correctly, I spoke to a very nice lady at the company, described what had been happening, and she said they had a "patch" for that very problem and would send me replacement disks in the mail. A week later, they arrived. That was a best-case scenario of how patches worked in the old days. The white-screen problem was fixed, but something else was gone as well: sneaky linebackers. That "squeezing" feature had actually been a bug! Back then, gaming was a voyage of discovery. Every game was a secret world. Back then, I felt like Columbus. Now, it feels like we're all in one massive tour group, with guides everywhere to tell us where we should be looking. It's not worse today, necessarily. Just different.